MIKHAIL GLINKA (1804-1857): Kamarinskaya (arr. Mily Balakirev [1837-1910]), Valse-Fantaisie in B Minor (arr. Sergei Lyapunov [1859-1924]), Capriccio sur des thèmes russes, Trot de cavalerie No. 1 & No. 2, Polka initiale in B Flat, PETER TCHAIKOVSKY (1840-1893): 50 Russian Folk Songs. Description: Twenty-nine minutes of fairly unhackneyed Glinka, some better known in orchestral versions, share space on this Russian recital with the 37 minutes of Russian folk songs harmonized by Tchaikovsky at his publisher’s request in 1868. This work is trove of themes (helpfully listed in the notes) which you’ll find in later works, chamber, vocal and orchestral, by Tchaikovsky. 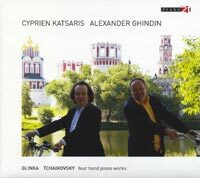 Cyprien Katsaris, Alexander Ghindin (piano four hands).